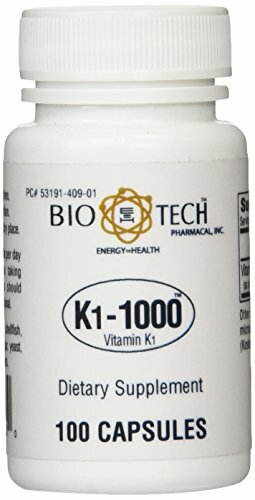 Vitamin K 1 or 2? Home Newswire Vitamin K 1 or 2? In the video above, Kate Rheaume-Bleue, a naturopathic physician and author of “Vitamin K2 and the Calcium Paradox” discusses the importance of this often-overlooked vitamin, and its synergistic effects with other nutrients. Vitamin K2 deficiency is actually what produces the symptoms of vitamin D toxicity, which includes inappropriate calcification of soft tissues that can lead to atherosclerosis. 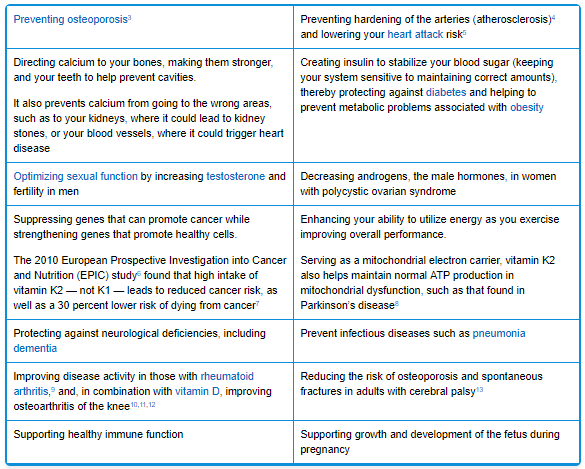 A recent article in Life Extension Magazine14 also highlights the cardiovascular benefits of vitamin K2. Importantly, a double-blind, placebo-controlled study15 published in 2015 found that taking 180 micrograms (mcg) per day of vitamin K2 (MK-7 form) for three years improved arterial stiffness in postmenopausal women, especially those who had a high degree of arterial stiffness. At the end of the study, the treatment group had a 5.8 percent lower stiffness index beta (a parameter of arterial stiffness) and a 3.6 percent lower carotid-femoral pulse wave velocity (a test that measures arterial stiffness). The placebo group, on the other hand, saw a 1.3 and 0.22 percent increase in these measurements respectively.